In September 1878, Claude Monet took up residence at Vétheuil, a village northwest of Paris. Although this period was marked by personal loss and financial hardship, it was also one of intense productivity. Over the course of the three years he spent there, Monet executed nearly three hundred paintings, and his art shifted away from scenes of modern life toward a more focused exploration of landscape and atmospheric effects. In the summer of 1881, Monet began work on a group of four closely related canvases showing a private garden bursting with sunflowers. Of the four paintings, the work now in the Norton Simon collection is closest in palette and composition to the one in Washington, and they share distinct elements absent from the other two works, such as the clouds and the placement of shadows in the foreground. The Norton Simon canvas has long been thought to have been the model for the larger, more detailed Washington picture, but recent examinations have called this theory into question. At some later date, Monet repainted the foreground of the Washington painting, at which point he mistakenly added the erroneous date of 1880, further confusing the works’ chronology. Separated in 1882, these two paintings have been reunited for the first time in this special installation. This extraordinary loan is part of an art exchange program between the Norton Simon Museum, Pasadena, and the National Gallery of Art, Washington. Inaugurated in 2007, its purpose is to allow select masterpieces from one collection to travel to the other institution to hang temporarily with its permanent collection. The Artist’s Garden at Vétheuil is the fourth painting to travel to Washington as part of this program. The installation was organized by the National Gallery of Art and the Norton Simon Foundation, Pasadena, California. For this text and more informations on this exceptional display of the “Jardin à Vétheuil” by Claude Monet, please check the National Gallery of Art website. The two works can be seen side by side until July 29, 2018. 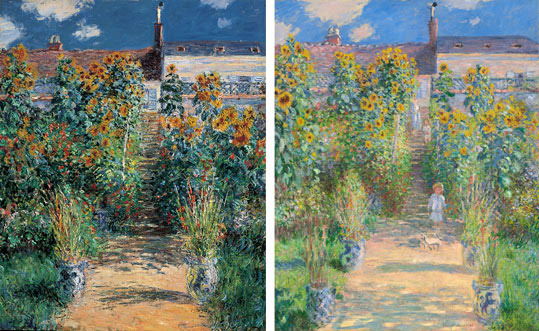 Left: Claude Monet, The Artist’s Garden at Vétheuil, 1881, oil on canvas, The Norton Simon Foundation; right: Claude Monet, The Artist’s Garden at Vétheuil, 1880, oil on canvas, National Gallery of Art, Washington, Ailsa Mellon Bruce Collection. Image courtesy of both museums.